Cycle Chic®: Portraits of cyclists: Lilian - "The day before I gave birth to my son, I was on my bike"
Portraits of cyclists: Lilian - "The day before I gave birth to my son, I was on my bike"
"I cycle everyday. So, I really need my bike and I love this one, especially the color." "What do you like when you bike in winter?" "I like to get some fresh air and to exercice." "What would be your tips to cycle in winter? Do you wear specific clothes?" "You should not dress to warmly, since you produce heat while you’re cycling. You really don’t need skiing clothes. You just need to wear a windproof outfit and of course a warm pair of gloves." "What is your most unforgettable memory related to your bike?" "The day before I gave birth to my son, the « water breaking » happened when I was on my bike on my way to the hospital". Even if it seems incredible for a lot of other countries, here in Danemark, women cycle when they are pregnant, and they even bike with contractions to the hospital. Read here. 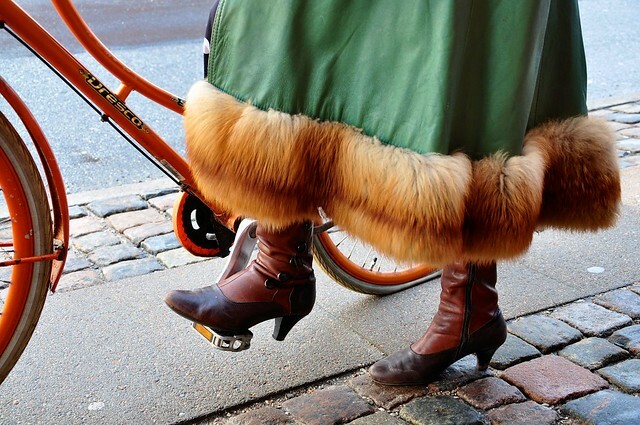 More pictures of Copenhagen every day on Byliv in CPH. Looks a bit like my winter coat in the late 1970´s. I just fainted seeing the garb in these pics! Lovely.